I recently got my hands on several Datacolor products and I wanted to share my thoughts about them with you. Datacolor is the global leader in complete calibration systems for printers, monitors and lenses. 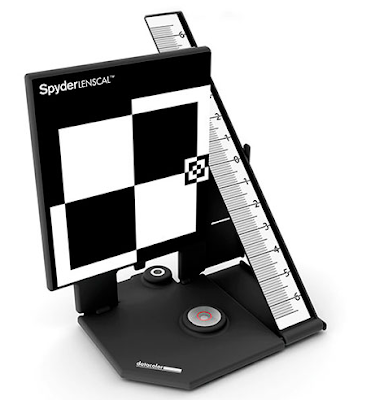 One of the most exciting calibration tools to hit the market in recent years is the Spyder LensCal™. Until I actually measured the focus performance of my camera and lens combinations, I excepted my images as being sharp. The Spyder LenCal™ provides a fast and reliable method of measuring the focus performance of your specific camera and lens combinations. It allows you to obtain razor-sharp focusing or just check to see that your lenses are working at their peak performance. You'll need to be shooting with a camera that supports and stores autofocus adjustments. Here are a few common cameras with such support. This clever devise folds flat for easy storage and has a 1/4 20 thread for stand or tripod mounting. I have calibrated each of my lenses & cameras combinations and I now have confidence that I have the sharpest images possible. For the small cost of $59.00, you can't go wrong. A few of my lenses required no adjustment at all. Here is a link to a video on how it works.